Company: Carnegiella strigata strigata (Marbled Hatchetfish) is suitable for community aquariums with other small species..
Aquarium setup: Carnegiella strigata strigata (Marbled Hatchetfish) prefers a densely planted aquarium with a lot of floating plants. The aquarium should be decorated using driftwood and a dark bottom substrate. The floating plants should be allowed to dim the light in the aquarium. Carnegiella strigata strigata (Marbled Hatchetfish) should only be kept in schools of 10 or more fishes. Feeding: Carnegiella strigata strigata (Marbled Hatchetfish) will usually accept dry food. 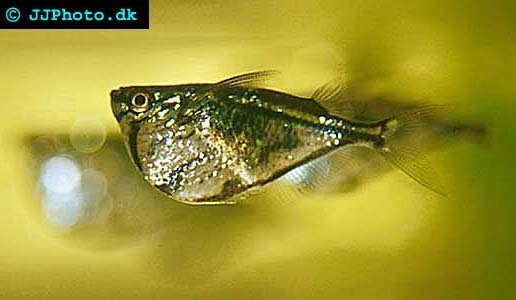 Breeding: Carnegiella strigata strigata (Marbled Hatchetfish) lay their eggs among fine leafed plants.